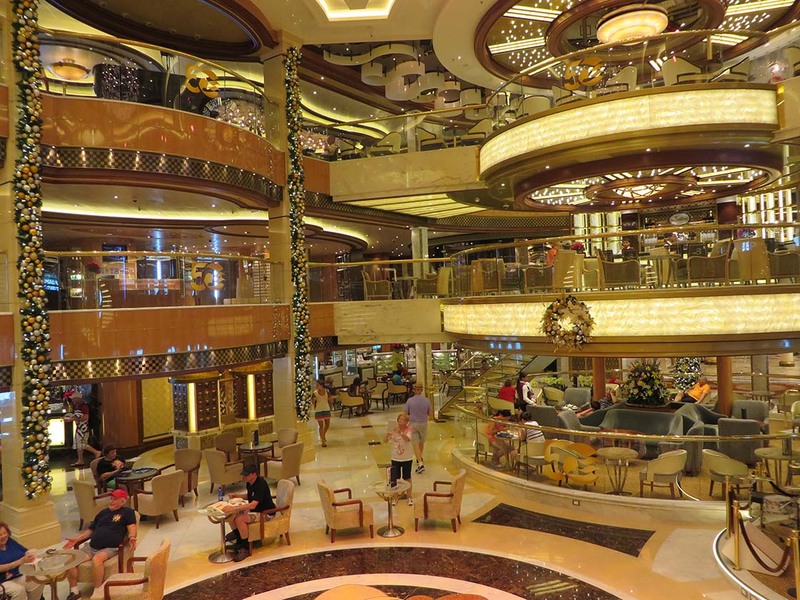 The Regal Princess — the newest ship in the Princess line — is my favorite cruise ship ever. 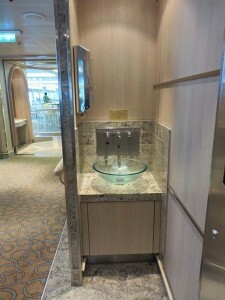 Maybe it’s just me, but the decor on most of the cruise ships I can afford seems sort of tacky. There are way too many Greek goddess statues and garish paintings for my taste. 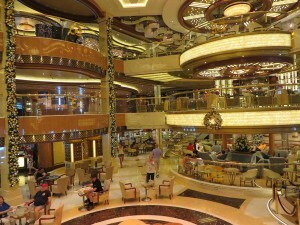 But the Regal Princess’s gold and white motif is classy and elegant. I cruised in December (during its inaugural season) and really enjoyed the gorgeous gold and white Christmas trees and decorations, and not seeing red and green for an entire week. 2) Free Zumba classes — twice a day! If you want to sleep through the 9 a.m. class, the late afternoon session is ideal. It’s held on the outdoor basketball court as the sun is going down and the air is cooling. 3) Free line dancing lessons — nearly every day or night. The instructor was knowledgeable and very patient, and the lessons were great fun. 4) A walk/run track around one of the upper decks. 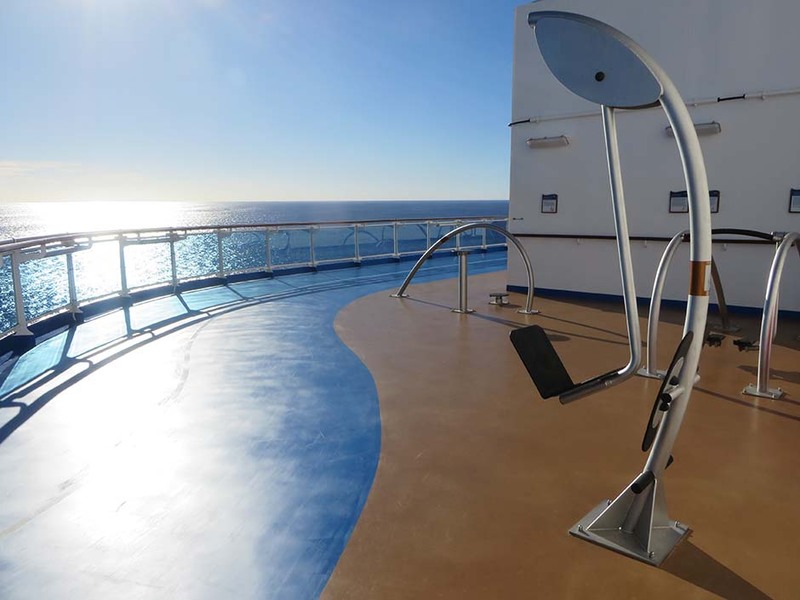 It has fitness equipment stationed around it, too, like a parcourse; a sign next to each piece explains how to use it. It’s a good way to break up 20 laps around the deck! 6) A much better food layout in the informal dining room (bistro) than on other Princess ships. The area is well laid out and easy to navigate. (The cafeteria-type lines on the two previous Princess cruises I took were poorly laid out, cramped and extremely slow-moving.) It’s as if the designers realized the error of their ways and corrected several issues — including this one — on this ship! 7) Cool face towels. When you return from a shore excursion sunburned and wilted, a Princess employee offers you a cool towel before you board the ship. This is a blessing during the summer, and a refreshing treat anytime. 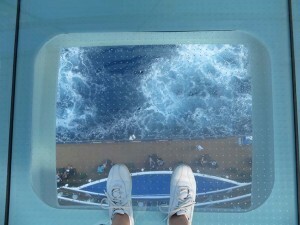 9) A dancing fountain on the top deck — something like the one at the Las Vegas Bellagio hotel (on a smaller scale). For a short period nearly every evening, the fountain is turned on, colored lights shine on it, and the fountains “dance” to music. It’s a nice touch. 10) Nightly Movies Under the Stars. 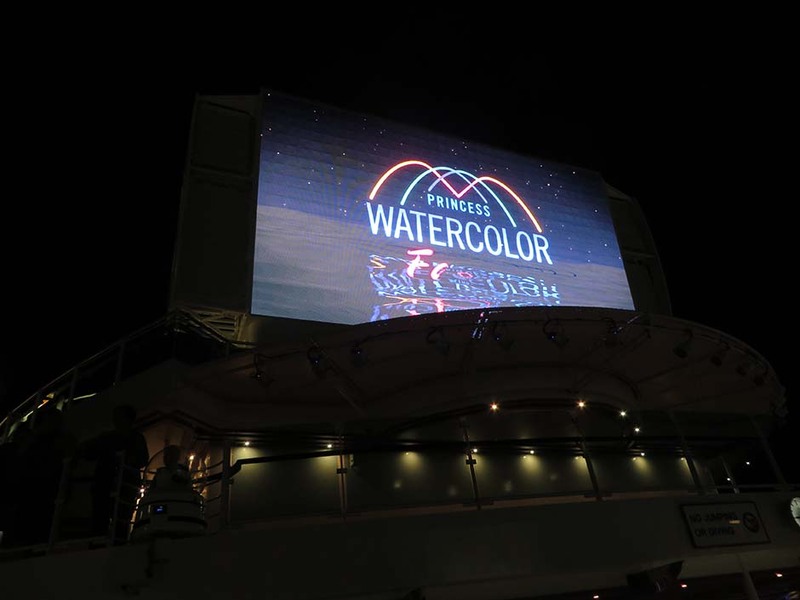 Every night, you can settle in a cushioned lounge chair on the top deck, snuggle under a light-weight blanket, snack on popcorn or milk and cookies, and watch a recent-release movie. 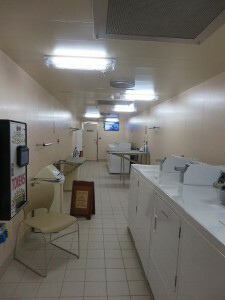 11) Self-service laundromats. 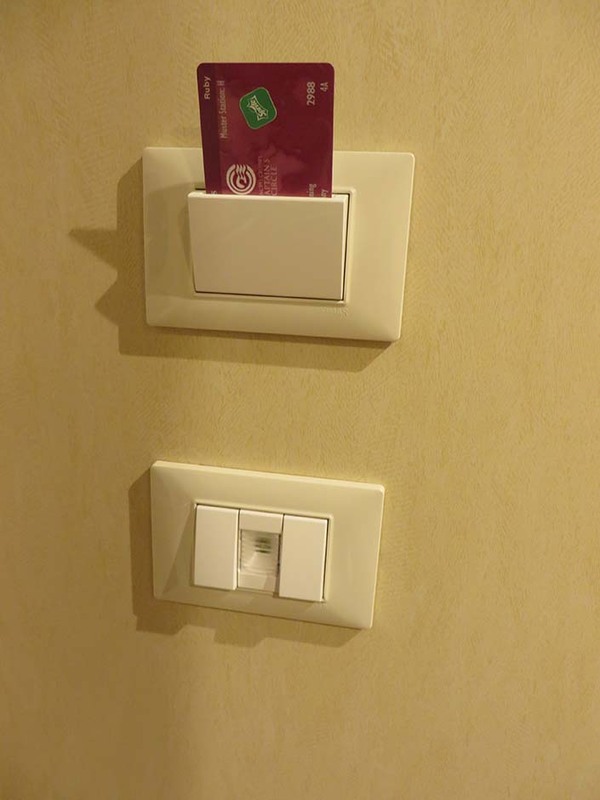 And they even accept the cruise card as payment. 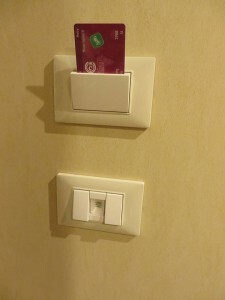 You not only don’t have to pay exorbitant laundry charges, but you don’t have to carry a roll of quarters with you. 12) A pop chorus comprised of guests who like to sing. A Princess “choir director” holds a couple of low-key practice sessions during the week, and the volunteer chorus performs for the guests on the final night of the cruise. It’s easy and fun if you like to belt out old rock ‘n roll songs. 13) Emergency drills conducted from an indoor lounge. If you’ve ever cruised, you know there’s a dreaded mandatory lifeboat and muster station drill for all guests the first day. And if you’ve ever stood on the deck in 100 degree heat wearing a bulky orange life jacket for 30 minutes like I have (almost fainted once), you’ll appreciate the luxury of sitting on a couch in plush chairs in an air-conditioned room during the drill. 14) A mini-golf/putting green on the top deck. There’s also a netted room to drive golf balls, with clubs furnished. 15) A netted room with several ping pong tables. 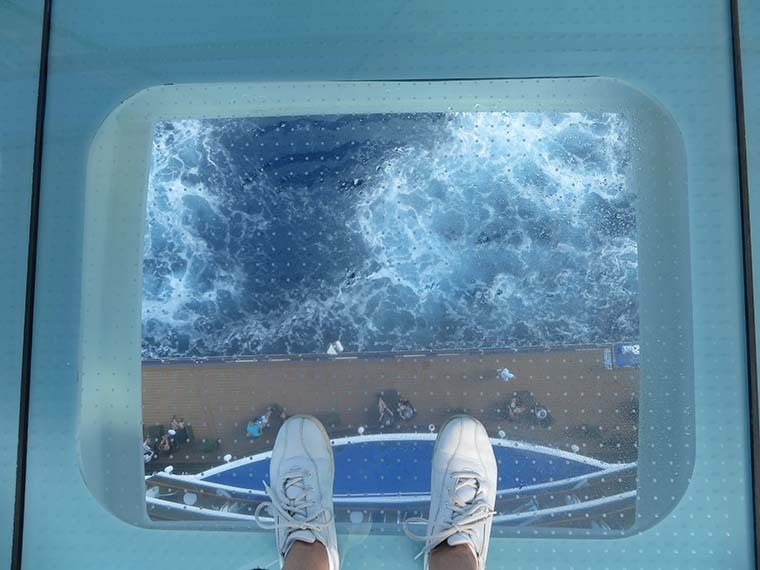 Other cruise ships have ping pong tables, but you have to chase the balls you miss all over the deck; the netted walls are really handy. 16) The adults-only pool area is luxe, and so is the nearby Sanctuary — where you can pay a fee and get a fancy chaise or cabana — and an even nicer pool — and all sorts of amenities, for a full or partial day. 17) Improved shore excursions. 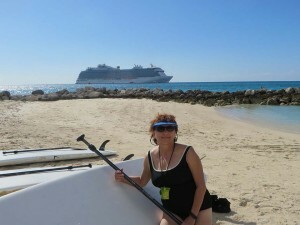 This cruise offered stand-up paddleboarding as a shore excursion; it’s the first time I’ve ever seen that. It was fun and reasonably priced. 18) A batting and pitching cage. 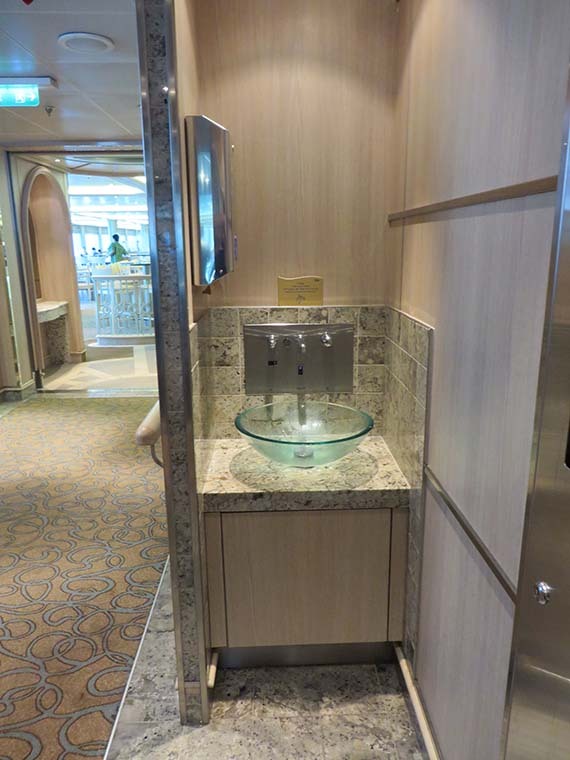 Another interesting item for anyone concerned with cruise ship sanitation and disease prevention: the Regal Princess has two attractive sinks in a little alcove at the entrance to the informal dining area, in addition to providing hand sanitizer pumps. I liked knowing my hands were soap-and-water clean before eating meals there! 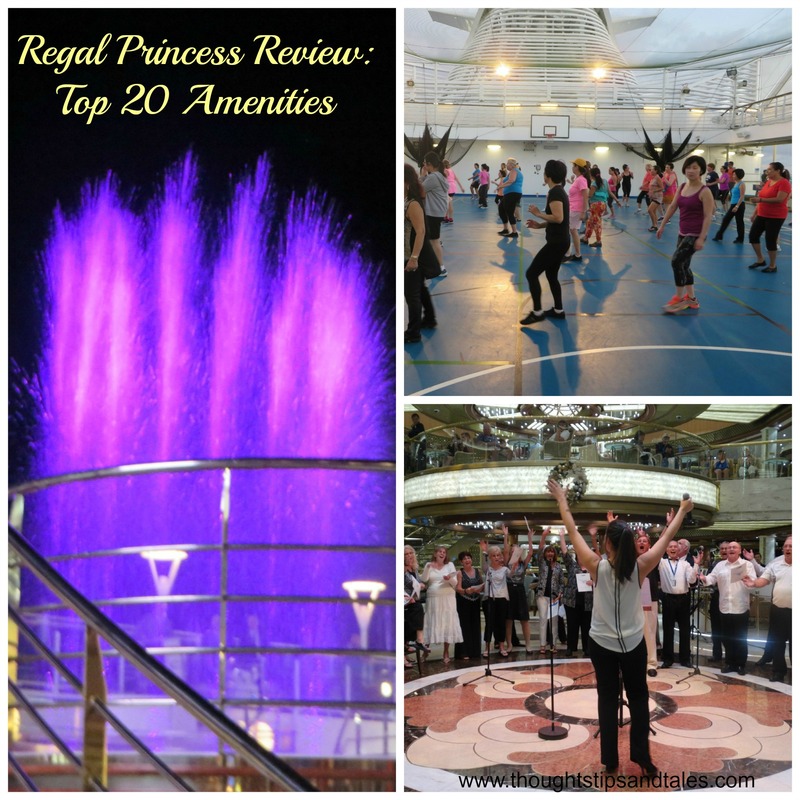 If you haven’t cruised on the Regal Princess yet, check it out. You’ll love it! 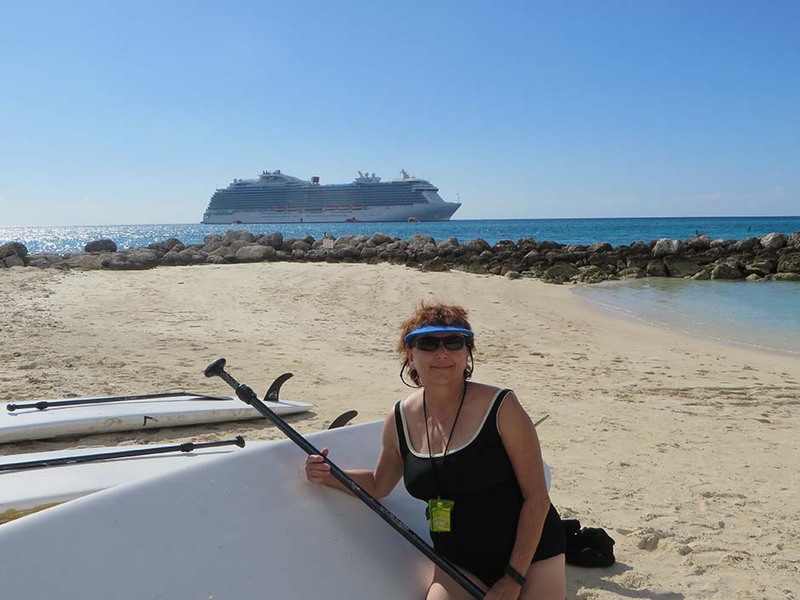 This entry was posted in cruising, cruising solo, line dancing, princess cruise lines, Regal Princess, travel, Zumba and tagged cruising, cruising solo, line dancing, Princess cruise lines, Regal Princess, travel, Zumba. Bookmark the permalink.